Therefore, I decided to implement a USART based communication protocol which would (if possible) ensure that the data sent over the USART link was reliably received and, in the case where recovery just is not possible, both the host and the robot would be aware that the link has failed (and can therefore do something sensible like turning off the servos). Since this implementation is useful for a range of projects I decided to implement it as a library which can be used for projects which require reliable, monitored data transfer over links which have a fairly high latency (such as radio-based links). In order to develop a complicated communication system you need to have a good, stable hardware reference design from which to work from. Since the protocol needs to deal with both Rx and Tx channel corruption as well as near-end and far-end resets (one or the other end ‘disappearing’) the reference hardware must allow you to create data-link failures on demand. 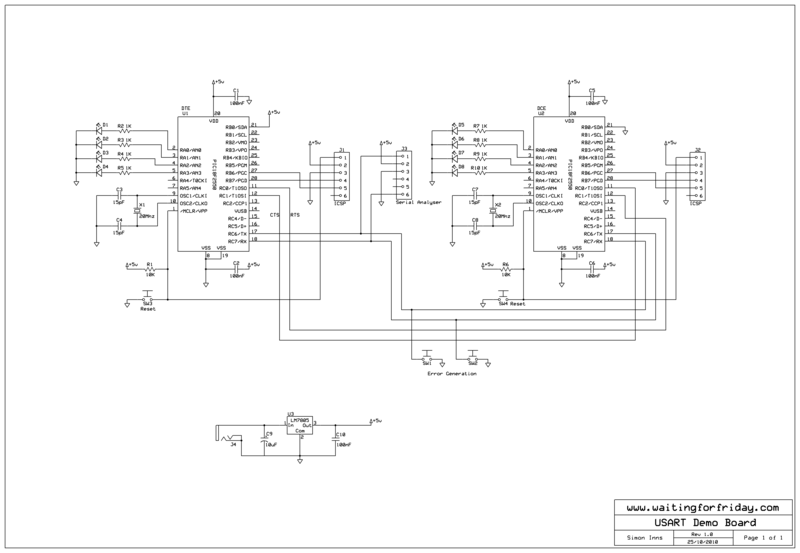 As can be seen in the schematic the hardware consists of two PIC18F2550 microcontrollers connected together via the USART Tx and Rx lines (in a DTE to DCE configuration). Both processors have 20Mhz oscillators to allow them to run at the full 48Mhz speed. 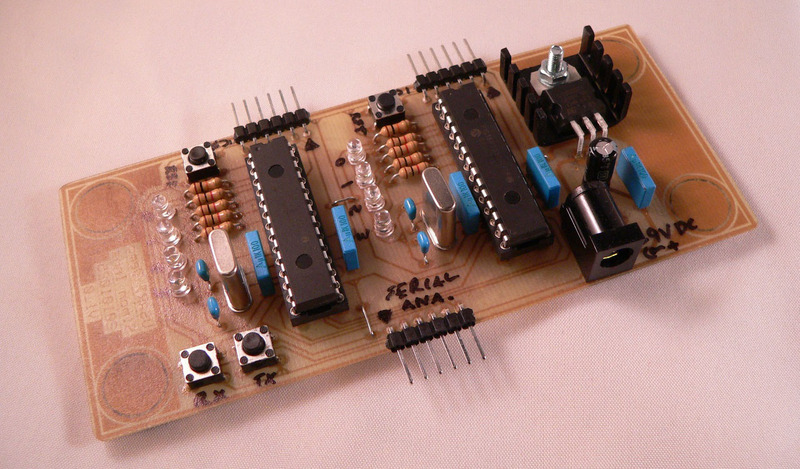 In addition both chips can be easily reset using push-buttons. There are a further 2 push-buttons connected between the Tx and Rx lines, both switches are then connected to earth. This means that, if you press one of the buttons, either the Tx or Rx line will stop functioning simulating a drop in the communication channels. Each PIC has 4 LEDs which are used to show the status of the data-link (up or down), the 2 remaining LEDs show the data traffic flow between the chips to make it easy to see if the firmware is functioning correctly. The hardware also has 2 programming headers to allow rapid development. In addition there is an extra header for the Microchip PICkit serial analyser which allows you to use the analyser in place of the DTE processor (I didn’t use this function in this project, but thought that it might be useful in the future for other work). One of the big issues with designing, coding and testing protocol stacks is that you have at least two sides to program. For the demo board I wanted to be able to program both PICs with the same firmware. To enable this I used RB0 on both PICs to indicate if the PIC was the DTE or DCE. RB0 is +5 volts on the DTE and 0 volts on the DCE. This allows an easy test in the firmware to determine the flow of the stack whenever necessary. As can be seen above, the PCB also includes space for some rubber feet to stop the board sliding around as you attach and detach the PIC programmer. Selective repeat ARQ – This is a more advanced version of Go-back-N where the receiver can request a particular frame to be re-transmitted. For links which have noticeable latency Stop-and-wait ARQ (Automatic Repeat reQuest) is not preferable as the utilisation of the available bandwidth is very low, since the transmitter spends most of its time waiting rather than transmitting. So the obvious choice is either Selective repeat ARQ or Go-back-N. I chose Go-back-N because selective repeat requires buffers on both sides of the communication (since frames can arrive out of order). Since the PIC18F2550 only has 2K of RAM (of which only 1K is available if the USB module is on) buffer space is at a premium. The Go-back-N only requires a frame buffer on the transmitting side so represents the best compromise of link utilisation and RAM use. You can find a good explanation of the 3 different types of ARQ on [http://en.wikipedia.org/wiki/Automatic_repeat-request Wikipedia] if you are interested in the theory behind how they work. The firmware is split into the physical layer (which deals with sending bytes over the physical interconnection) and the data-link layer (which deals with link monitoring, error correction and flow-control). The physical layer is responsible for sending and receiving bytes to and from the USART hardware. It is not concerned with the reliability of the transferred data, but it is obviously preferable that the physical layer is as reliable and efficient as possible. The buffer pointers are incremented using a simple modulus (%) operation which causes the counter to ‘wrap’ back through zero once the maximum buffer size is reached. With this style of cyclic buffer implementation the start and end pointers are equal when the buffer is either completely empty or totally full. Therefore a buffer level variable is kept in order to track the status of the buffer. To send and receive the data 2 interrupts are used; one is a high-priority interrupt which deals with filling the Rx buffer with received data and the other is a low-priority interrupt which deals with sending the data stored in the Tx buffer. The Rx interrupt is triggered by the RCIF interrupt condition (indicating that a byte is waiting) and the Tx interrupt is time-based (and is called 20 times a second). The Tx interrupt is also used to update an ACK timer which is used by the data-layer to time-out ACK frames (it is included in the physical layer for coding convenience, but really belongs in the upper level). // Do we have data waiting? As can be seen above, if an overrun condition occurs (another byte is received before the current one was read) the condition is automatically cleared (but at least one byte is lost). Also if the Rx cyclic buffer overflows, the firmware simply discards bytes until there is room again. The physical layer also provides a reset function which clears the Tx and Rx buffers. When reading or writing the buffers the Tx and Rx interrupts are temporarily disabled. This prevents the possibility of two simultaneous updates to the buffers. The optimum size of the Tx and Rx buffers is dependent on the available RAM as well as the amount of data expected from the upper layer (especially around how ‘bursty’ the data will be. Due to the ‘bursty’ nature of a go-back-N ARQ algorithm the receive buffer should be around the same size as the overall transmission window. For example, if the packet payload size is 32 bytes and the overhead is 7 bytes with a window size of 3, the buffer should be (32+7) * 3 = 117 bytes minimum to a maximum of (64+7) * 3 = 213 bytes if you expect a lot of byte stuffing in the frames (byte stuffing is covered in the data-link section below). The Tx buffer is less of a problem. The lower it is the more the stack will have to wait causing less utilisation of the available BPS (bits per second) from the USART. The data-link layer is where most of the complexity of the implementation resides. The major functions of the data-link layer are included below with explanations of what they do. Since the stack uses a flag byte to denote the start and end of the frame (which is variable length) it is necessary to use ‘byte stuffing’ to prevent the far-end misinterpreting payload data as a flag. The function does this by placing an ESCape code before any flag bytes which appear in the data, this also means the stack needs to ESCape any ESC bytes which appear in the payload also. This processes is known as ‘byte-stuffing’ and it means that, even if our maximum data payload is 32 bytes, in the worst case our real payload could be 64 bytes. // Do we have any data waiting and is the frame buffer not ready? // Did we get the flag byte? // Are we receiving the header? // Is this an esc value? The transmit frames section is responsible for sending frames either for a command (such as ‘data link establish’ or ‘Clear to Send request’) or for data. The code automatically generates link establish and CTS frames when required (i.e. during the data link establishment phase). The reason for a 2 step set up is that the far-end must have time to respond to the link coming up before data starts to be sent, so the stack uses LINKREQ_FRAME to bring the link up and then the two sides send a ‘clear for you to start sending’ message before the far-end starts the data flow. This mechanism assures that both sides are in a ready state before the ‘valuable’ data frames are sent for the first time. // Is there a free slot in the transmission window? The ‘process received frames’ section is invoked when the frame reception state machine flags that the receive buffer is ready. Firstly the received frame is verified using the verification function (not shown here) which sets the received frame number and returns the type of frame received. If the frame cannot be verified the frame is set to the pseudo-type of ERROR_FRAME and is simply ignored. If the received frame is not an ACK frame (i.e. it’s a data or command frame) the received frame number must be what was expected otherwise the frame is dropped and the receiver sends an ACK requesting the frame which was expected, if the received frame number was correct the code sends an ACK requesting the next frame in the sequence and so on. // Do we have a received frame waiting to be processed? // Is it the requested frame number? // times-out if anything goes wrong. The main.c source file contains code which assembles data to be sent and received by both the DTE and DCE simultaneously. Each data frame send cycles through the whole range of data which the frame can contain. The receiving-end verifies that the data was correct. If the data-link drops it is automatically re-established and the data-frame sequence is reset. In order to verify the ‘inner-workings’ of the stack there is a test mode definition which can be set (#define TESTMODE 1). If this flag is set (at compile time) the stack will increment a number of counters which show how much each part is being invoked. The main.c code will send 1000 data frames and then go into an endless loop. By switching MPLAB into debug mode and breakpointing on the endless loop you can use MPLAB’s watch window to capture the values of the counters. By using the figures from the sunny-day run you can calculate that the ratio of data in to bandwidth used is about 1:1.47 over 1000 frames (so for each byte of real data 1.47 bytes are actually transferred). For the rainy-day scenario you can use multiple tests in the target environment to select the right levels for the timeout and retry counters to ensure the most efficient use of bandwidth with the correct level of data-link resilience. Since the PIC18F2550 only has 1K of RAM available (when the USB module is on) the amount of RAM consumed by the stack is important. Compiling the stack (with test mode deactivated) show that, with a window size of 3 and a frame size of 32 data-bytes), the stack requires only 535 bytes of RAM. If the USB module is not required the window size could be easily expanded to make the stack more bandwidth efficient. By editing the values found in both datalink.h and physicallayer.h you can easily manipulate the various buffer sizes as well as the overall window size. It is even possible to alter the maximum data payload size for the frames. This library is the result of several weeks work experimenting with the USART and data protocol design and I very much doubt that there isn’t any room for improvement. If you have suggestions on how to make the library more efficient (in terms of both bandwidth and RAM usage) I would love to hear from you in the comments.